Ballpoint pens used to be my thing. The thick ones at that. As of late, however, needle tip pens have taken over my desk (and heart). I just love the way they feel and write so precise when bullet journaling or squeezing in that last minute doctor's appointment into that teeny tiny spot left within the monthly calendar. 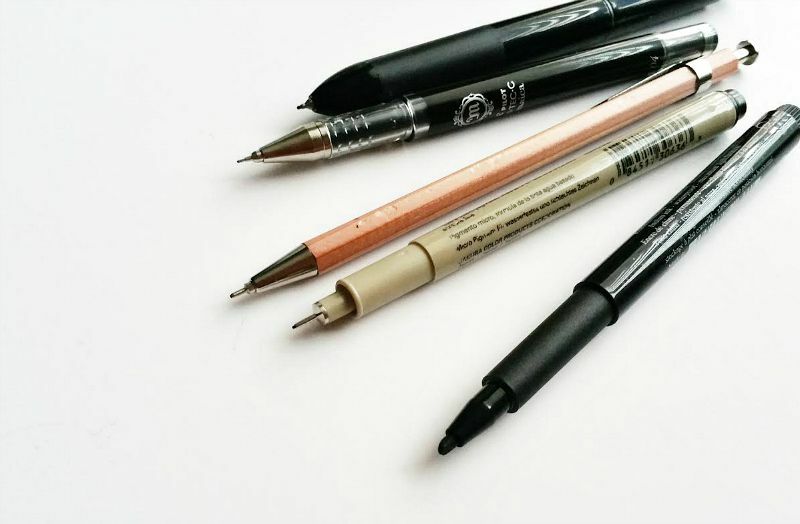 • Faber-Castell calligraphy pen- Although this isn't a fine tip pen, it's still a favorite that I reach for almost everyday for sketching and random doodling. I just had to include it. • Micron 01 pen- This pen is perfect for drawing those fine details or writing in the tiniest scheduling plans within the planner. • Delfonics wooden pen- Also known as my midori notebook's sidekick as they travel everywhere together. I get asked a lot on Instagram where I got this pen, but being that it was given as a gift, I'm not exactly sure where you can but these on a regular. I notice that Amazon always has them in stock, though, if interested. • Sharpie Pen Retractable- I just came across this pen last week, and I absolutely love it. It reminds me of the smashbook pen that I enjoyed using so much for my art journaling, just minus the glue-stick on the end. The ink is so nice and bold, yet doesn't smear as it dries almost instantly. I love super fine tip pens and am very intrigued by that micron! I am into ultra fine too! Check my post I talk about it! I love the sharpie ones that come in a lot of colors! The colored sharpies, yes! Those are also a part if my growing pencil case. By the way, thank you for linking me to your post! All those pens, and for such a sweet deal! Microns are great. If you like fine point pens - I can't recommend the moma muji 0.38 pens highly enough. They are cheap (10 for $14) and write smoother and finer than anything else I've tried. Perfect for sketching or writing on a daily basis. Good to know! Thank you so much! I'll be sure to pick these up and give them a try. I'm also rather a fan of the needlepoint pens - they make clean lines and I find they make my handwriting better - but I find they wear down. It looks like yours have too. Does that bother you? Or do you notice that? Sometimes they wear down slightly unevenly and then it's like having a tiny, tiny calligraphy tip. Yes, I've noted that the tip on my micron especially has worn down, but it doesn't really bother me. It could be that I'm also 'hard' writer as well. 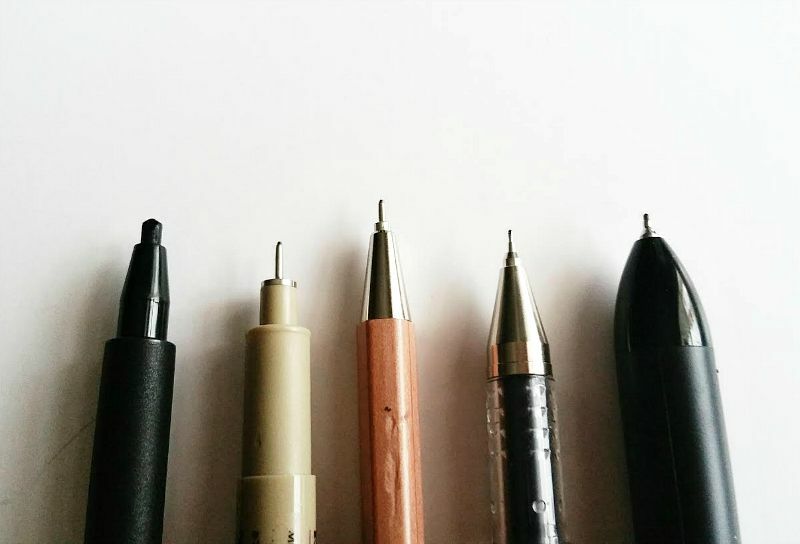 I really push down on my pens, so I can see how they would wear down easily. You can buy the delfonics pens at http://www.notemaker.com.au/ !! They just got a heap of colours back in stock. I have one of the mechanical pencils and it's awesome, it looks like a woodcase pencil only it's better! Oh nice!! Good to know. Thank you so much! I like the microns (but a 5, I don't like things tooooo fine!) because they don't bleed through anything. At work, however, I use a pen that I buy in the boxful from Amazon (because they are hard to find locally. That would be my beloved G2 BOLD blue. Yep, something Gee Whiz, something two, something bold, something blue. Nice page, Michelle, Keep Up The Good Work!